NEVER defrost using a microwave. That will change the texture and taste of the meat, as well as reduce the tenderness. It's best to move the frozen meat to your refrigerator 24 hours before you will need it, allowing even more time for roasts and thicker cuts. Bring your meat to room temperature before cooking -- don't cook it cold, straight from a refrigerator. 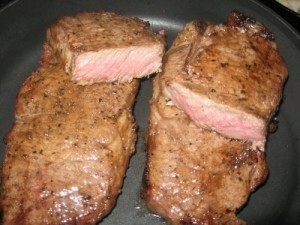 Avoid using salty or soy based liquid marinades since salt tends to draw the juices out of meat. 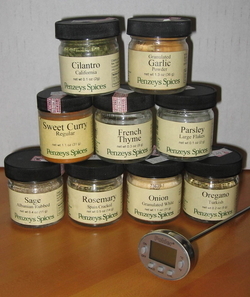 It's better to use spice rubs or marinades that are oil and herb based. If you want to add salt, do it at the last minute, or in the pan while cooking. To cook perfect ground beef. I use this two tricks with success everytime to help protect the leaner grass fed ground beef from being dry or tough. I place the chopped ground beef in the pan and add 1/4 cup of water then cover. As the water steams it helps cook the meat and keep the meat from drying as it is cooking. As the ground beef get closer to your desired doneness you can remove the cover and stir until there is no liquid in the pan. There should be no fat to pour out when finished cooking. At this stage it is best to add the seasoning. Some of the tastiest and most tender beef cuts are the ones that start out the toughest, but are also the least expensive! You normally won't even find them in the grocery store because they're often made into ground beef. What a waste! Brisket, pot roast, chuck roast, bottom round roast, and others are economical and delicious when properly cooked. Use the following image as a cheat sheet for knowing when to take your steak off the grill!